A blast of hot air met me as soon as I’d unloaded my bag, a stoller and my kiddo from the bullet train. Ay, mi Sevilla. Nearly two months had passed since the Feria de Sevilla, but that’s the best part about this city – it never seems to change. Not random wooden mushroom where a bus depot once stood, not fiery new gastrobars cozying up to age-old casas de comida. Sevilla is Sevilla. Forever and ever, amén. A staple in my Spain life is my guiri group of girlfriends, las sevillamericanas. So when one comes back from Indosnesia for a weekend, believe me when I say I’m not spending my euro coins on the high-speed train to stay at my mother-in-law’s; Kelly’s estancia in the city where these Chicagoans-turned-trianeras merited a fast trip down for catching up and eating up. And documenting on social media – we are nothing but slaves to our screens. My friends love food but I’d been clued into the new kid on the restaurant block, Aníbal. “But you don’t even live here! How do you even know what’s new?” In a city that makes eating fun and one of Lonely Planet’s top picks for 2018, there isn’t a lot of elbow room for a brand new bar. But an old school vibe? My friend Rafael Toribio was one of the first to put a bar on a rooftop in Seville, housed in a botique hotel with views of Old World Seville’s Giralda and the modern Metropol Parasol. Now that terrace bars in Seville are de moda, Rafa has moved on and, along with two other socios, bought an old palace in the heart of Santa Cruz, just an uphill stumble away from one of Spain’s famous flamenco tablaos and a cheap tapas bar where Kelly and I would spend our hard-earned private lessons money. 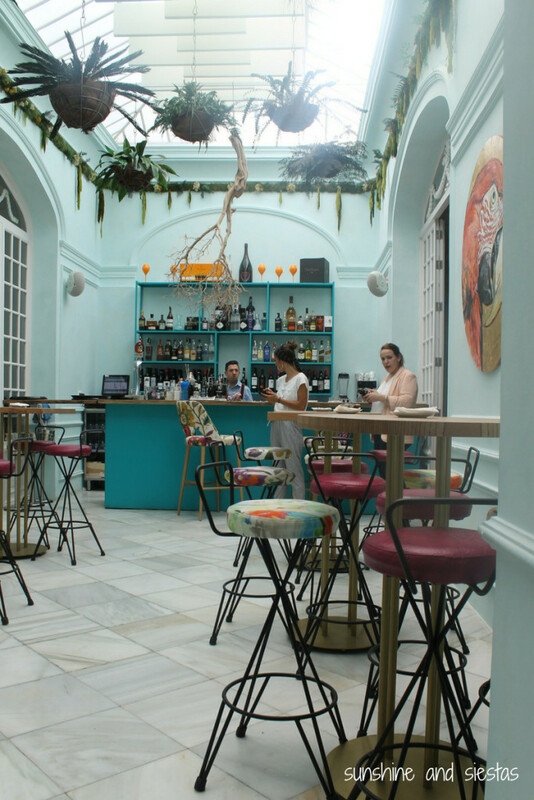 Airy and expansive, the restaurant is located in a casa señorial on Calle Madre de Díos, buried in the heart of Barrio Santa Cruz. Comprised of several rooms around a central patio andaluz, several of the original elements, like elegant fireplaces, frescoes and iron chandeliers. The front bar is roped off by heavy velvet drapes, seemingly out-of-place in a modern spin on a protected building. 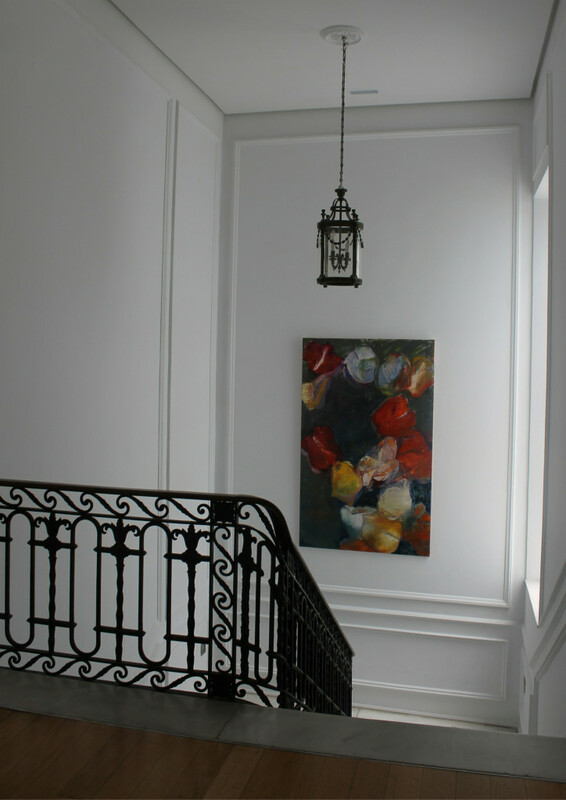 But once you walk into what was once a parlor, the space feels open, lit by natural light, and a fusion of old and new. 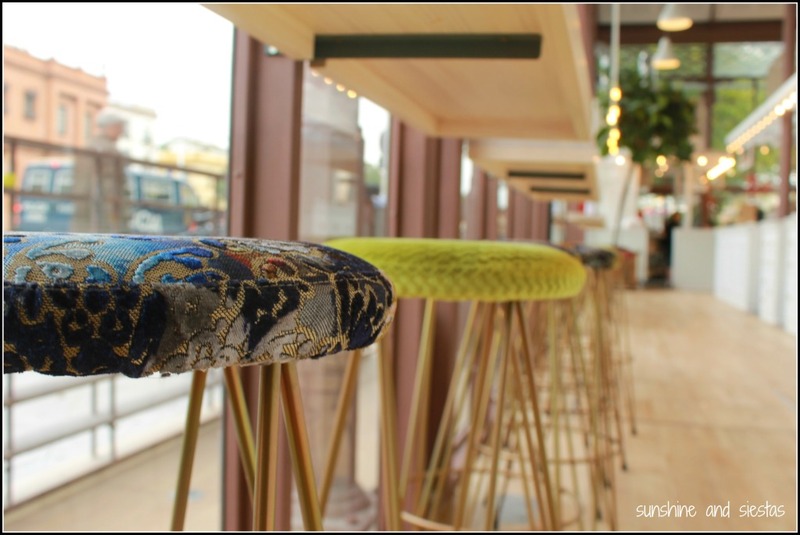 The word Origen seems fitting – the jungle theme is snaked throughout the space in playful tones and nods to continents where Spain has left a cultural legacy. Given that the menu has hints of these countries and flavors, the play on cultural elements allows each room to have its own feel while staying true to the theme. We were sat at a high wooden table. Had we been more than five it would have been too large to reach across the table and share food and gossip, but we formed a U, never out of arm’s reach of the plates or the bottle of wine. We each chose two – we’d ordered half the menu and requested our vegetarian friends have some off-menu items, like grilled espárragos trigueros, coarsely chopped tomatoes drizzled in olive oil and revuelto de setas. The food offering is mostly based on what’s fresh and in season, plus some market finds that sneak onto the fuera de carta menu. They’re rooted in old school Andalusian cooking with a modern, international twist – and oh-so-perfect for an Instagram feed. For the most part, the food was spot-on – full of flavor without departing from traditional methods or tastes. The tuna belly got fought over, and the crab meat with the creamy salmorejo provided the right touch of texture for a hot summer day. I found the lack of options for vegetarians to be surprising and disappointing, especially given that when I called, I was even asked if anyone had any dietary restrictions! I didn’t try the revuelto de setas, but it came out cold and watery and like someone had forgotten the salt. Invita la casa, the maître’d announced, setting down a barrage of sweets. 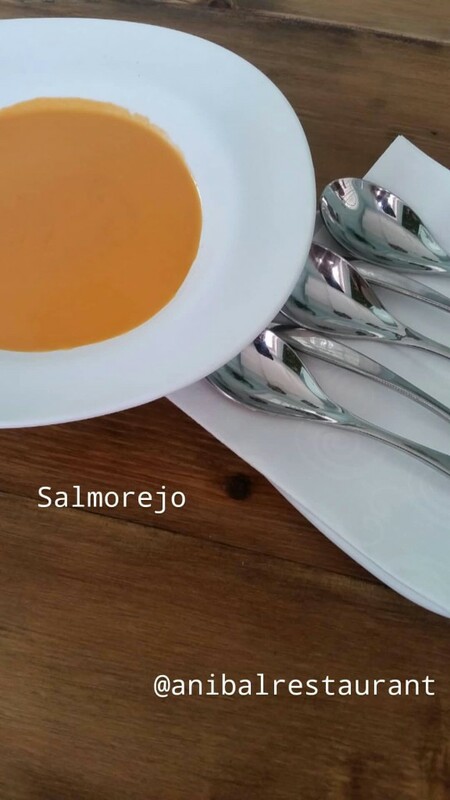 True, it was a hazy day in late June where the restaurant sat empty – locals were assaulting the beachside chiringuitos in Cádiz – but we never had to flag down a waiter or send back any food. In a city where good service isn’t the norm, I had zero complaints. We could eat and gaggle in peace but never be without a full glass in hand. 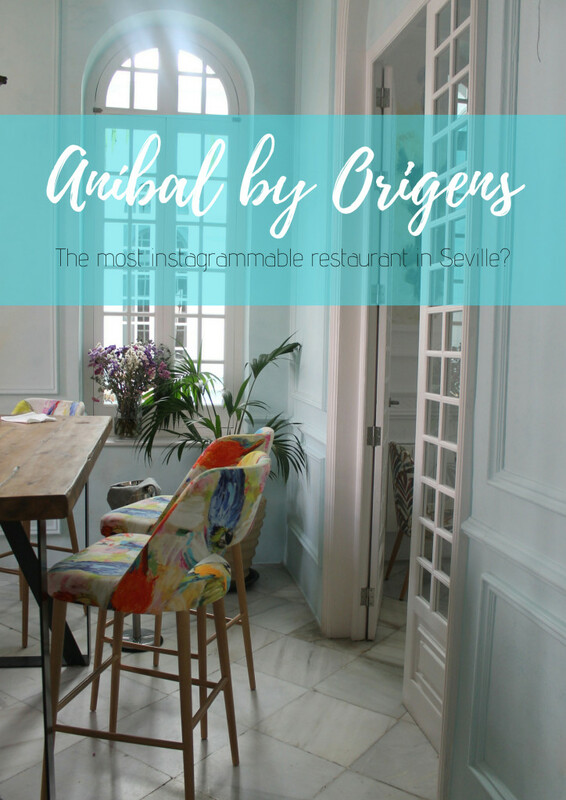 Aníbal won’t make my short list of haunts in Seville – I’m far more partial to places with crass bartenders and a wine list that consists of only tinto or blanco – but it’s r for a fancy night out, a cocktail or Instagram postureo. 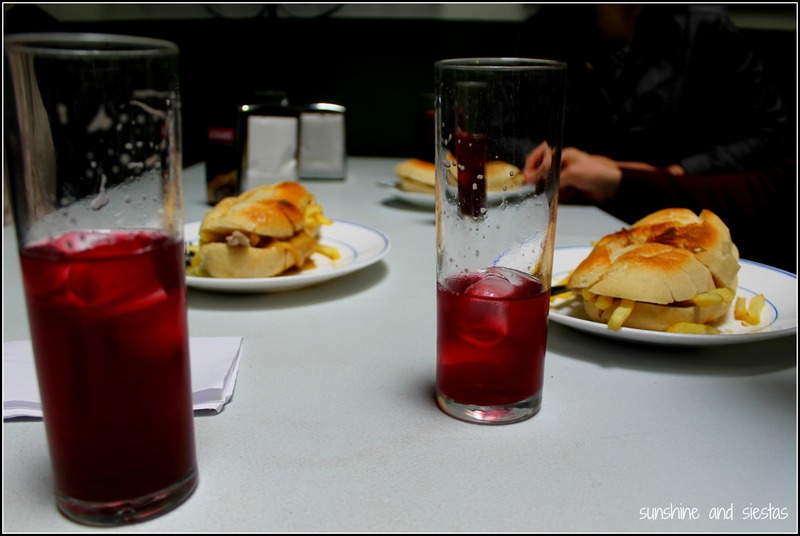 We paid about 22€ a head with food and drinks and the cubierto – a bit pricier than most other restaurants in Barrio Santa Cruz but less than I’d have paid in Madrid by at least a nice bottle of wine. There’s no doubt that Sevilla is changing. But the more the city seems to reinvent itself, it always stays true to its (ahem, rancio) roots – even when a restaurant touts a modern look and feel. 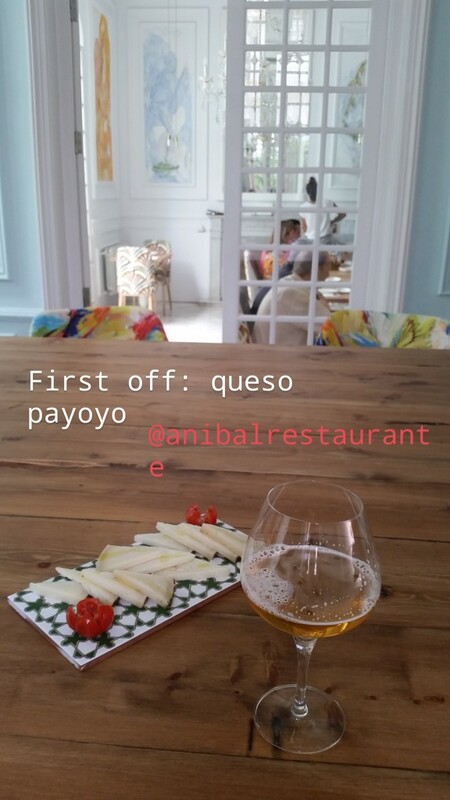 You can follow Aníbal on Instagram and Facebook and check out their pop up events – everything from cocktail master classes to designer markets to music on their rooftop. 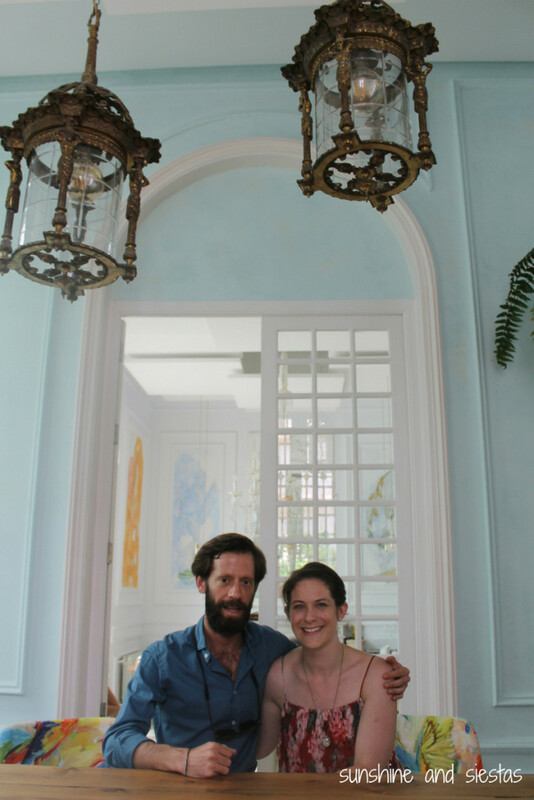 Full disclosure: Aníbal kindly picked up our desserts and coffee, but opinions are – and will always be – mine. Aníbal is open Tuesday through Saturday from noon until midnight or 1am. 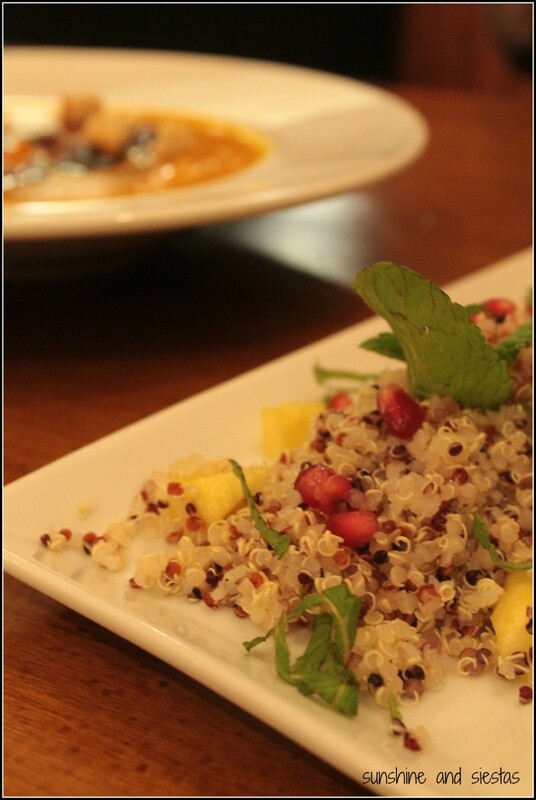 You can make a reservation by calling 672 44 85 78. Have you been to Aníbal? 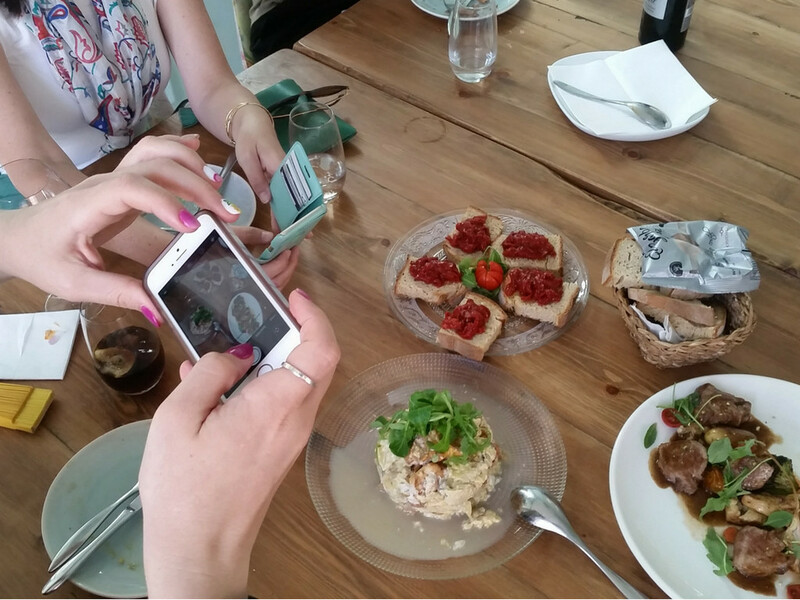 Know another restaurant that’s worth an instastory? Comment below! You can also view my posts about the best tapas bars in Seville and Spanish Tapas 101. “So we’re initially going to just be making plans for cervezas and tapas, correct?” One of my closest friends was just a few weeks away from his trip to Seville, and he’d planned the itinerary for me: a week of eating, drinking and catching up (and that’s just what we did!). When it comes to showing friends, family and even readers my adopted city, they see less of the city’s monuments and off-the-beaten track gems, and far more grubby old man bars and fancy gastropubs than museums. 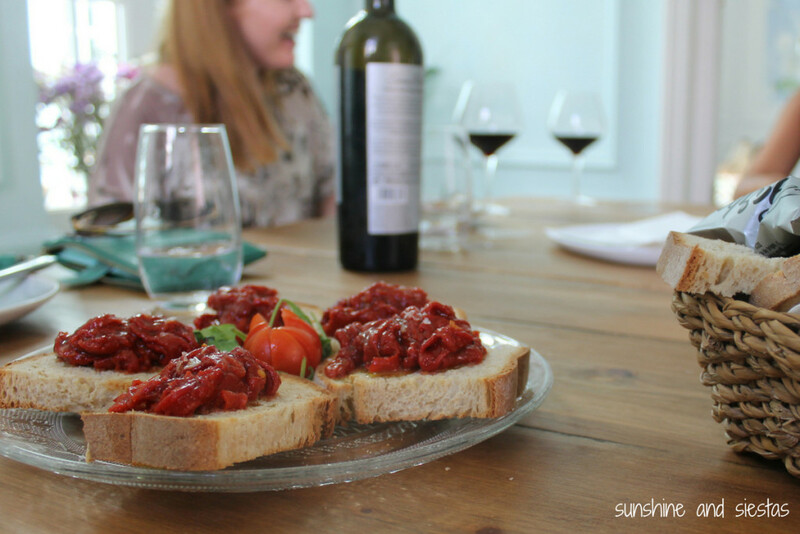 My heart is happiest when my belly’s been wined and dined, and I love sharing Seville’s food culture with them. I’ve eaten my way through Spain, from gastronomic sweetheart San Sebastián to family farms in Málaga, and Seville remains my favorite food city in all of Spain for three very important reasons. If variety is the spice of life, Seville can only be described as zesty. Apart from the serving sizes and types of eateries, the sheer number of bars is dizzying. While it would be impossible to count the number of bars in the city, figures tend to land in the 4,500 – 6,000 range when it comes to establishments for a bite or sip. Even if I wanted to try every single one, from the hole-in-the-wall abacerías to the Michelin-lauded gastro experience, it would take me years. And the question I get most from my readers, ‘Where should I eat in Seville?’ is harder to answer than you’d think. 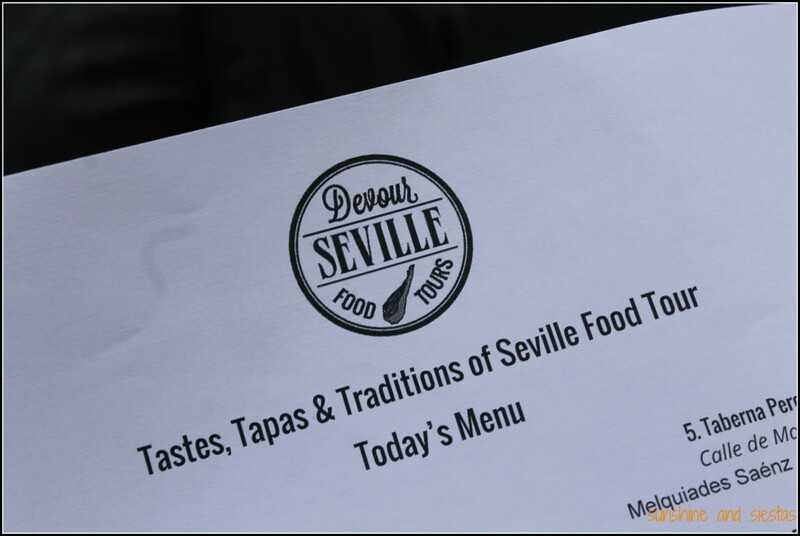 Taking a mid-morning tapas tour with Devour Seville, a food tour company with operations in four Spanish cities confirmed that. 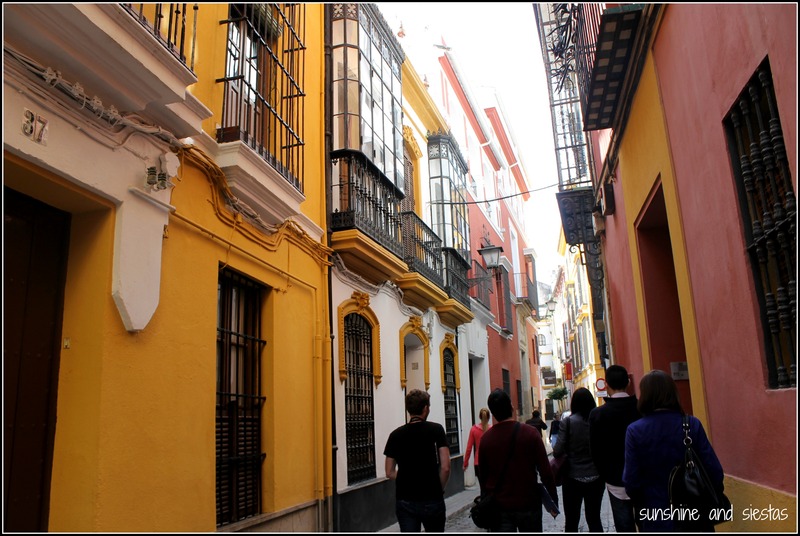 In fact, Lauren and I mused about other places that Devour Seville could have included on their four-hour tour through Seville’s central neighborhoods. Andalucía’s flamboyant capital has no shortage of choices, and tour guides are even thrilled to make recommendations for dinner. So, choice is a factor, but it gets even trickier from there. Bar or restaurant? Sit down or stand up? 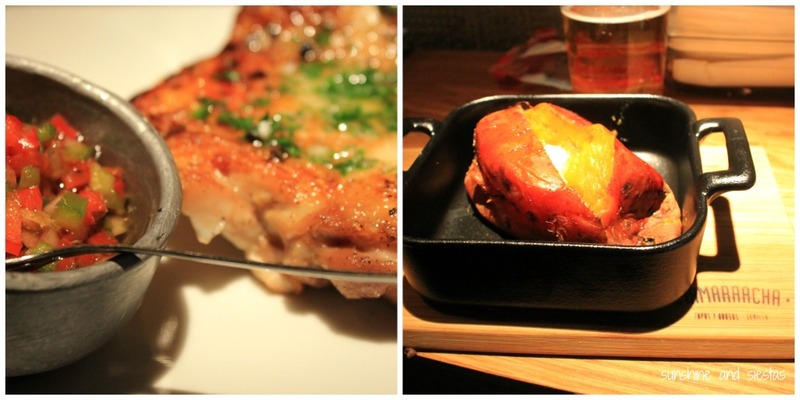 Trendy gastrobar or traditional tavern? Should we split large plates, or have everyone get their own tapas? And just how hungry are we? What sets Andalusian cities apart from their northern counterparts in many cases is the serving size options you’re allowed. Lauren explained that the word tapa – Spanish cuisine’s global export – has several different origins, though the most common is that bartenders would plop a morsel of food on a thin-lipped sherry glass to keep out fruit flies. This practice, said to have come from Seville’s little sister city of Jerez, is one of the easiest ways to sample and share food. If you’re hungrier, choose a ración or media ración. And, of course, then you have to pare down a menu and decide what to eat and what to drink. 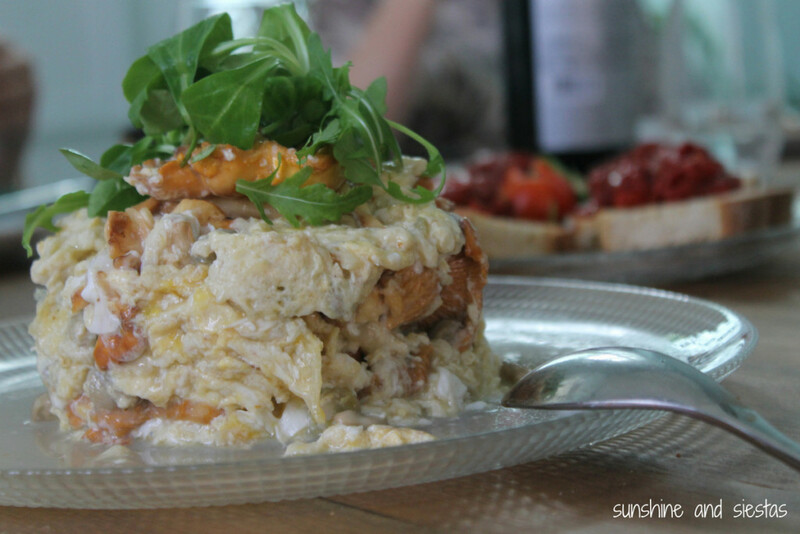 The tour had several Andalusian hallmarks but left behind the tortilla, huevos estrellados and gazpacho. After a morning of chowing down, we’d tried eight different dishes, each with a backstory of is origin and the establishment that served it. In the middle of the morning, Lauren led us to a cluster of churches in the heart of Barrio Santa Cruz. Once a pocket of the city where Jews, Moors and Christians mingled and traded freely, there are traces of culture on every block and hidden beneath the citrus fruit trees that perfume the city and the almond trees planted further east. 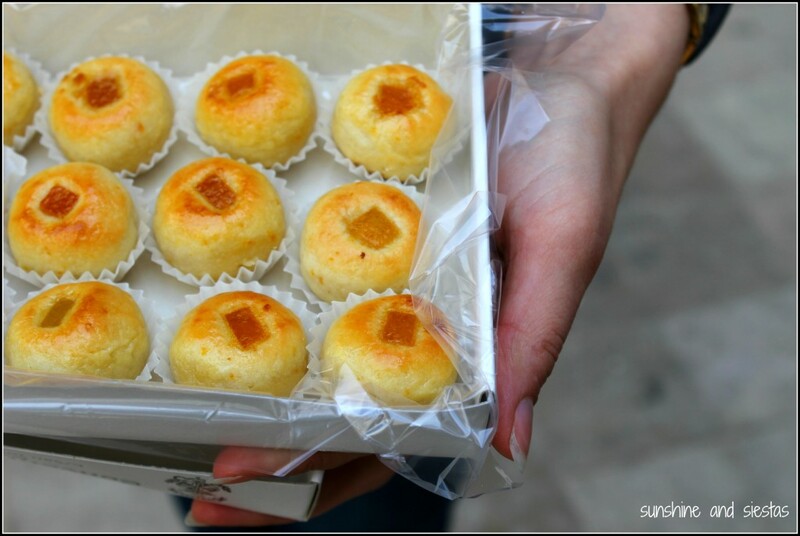 Their sugar and egg pastries are baked in convents around the city (many made with oranges, lemons or almonds! ), and though Spanish baked goods don’t do much for me, the naranjines we tried were actually sweet with a touch of citrus! Additonally, Seville was truly the gateway to the New World and Africa, with ships coming and going from the port and bringing products from far off lands. 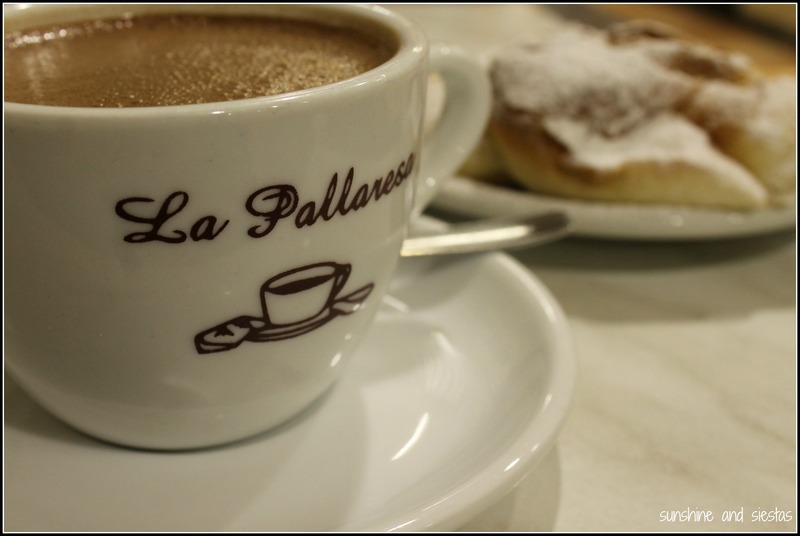 The city grew fat off of riches from its discoveries before the gold and silver was taken to Madrid on the Via de la Plata, but the gastronomic heritage remained. After a pit stop for a few sips of orange-infused wine, we walked through the city’s historic quarter and into the once-gritty El Arenal neighborhood, where ships were repaired as they unloaded their goodies. The New World brought the tomatoes for your gazpacho, the chocolate you dip your churros into and the potatoes served with just about everything from montaditos to meat dishes. Another fascinating tidbit of local history lies in the twelve city gates that once punctuated the walled city. As we walked under the Postigo del Carbón, Lauren gave us a run-down of other food-monikered gates to the city, like meat and olive oil. By this time, we’d snacked and tried several sorts of drinks, but we’d worked up enough of an appetite for the main course: tapas. I felt like we walked less on the Devour Seville tour than my previous taste tests with them in Madrid and Barcelona, but Seville is the longest tour! Even after winding through the streets of Encarnación, Santa Cruz and Arenal for four hours, I felt strong enough to have one last beer with another tour-goer at primetime on a sunny Friday! All of my guests are surprised at how easy it is to walk around Seville – even if getting lost in the winding, cobblestone alleyways is part of the experience. The city sits at 11m above sea level and there’s one ‘hill’ in the whole place! Besides, Seville is beautiful, between the tucked-away plazas and tiled entranceways, so it’s easy to be entranced. 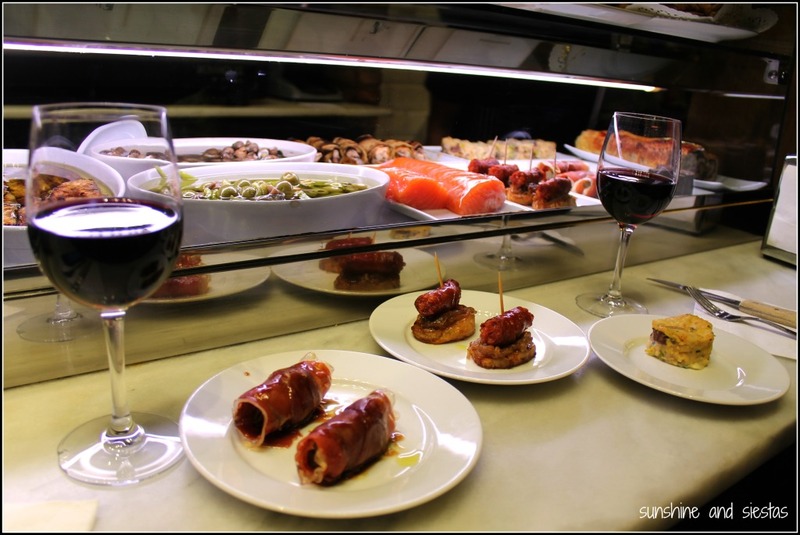 A true tapas tour doesn’t just settle for one eatery – it’s quite normal for the hungry to go from bar to bar, ordering one drink and one plate before moving on to the next. And don’t expect to sit down at a table. 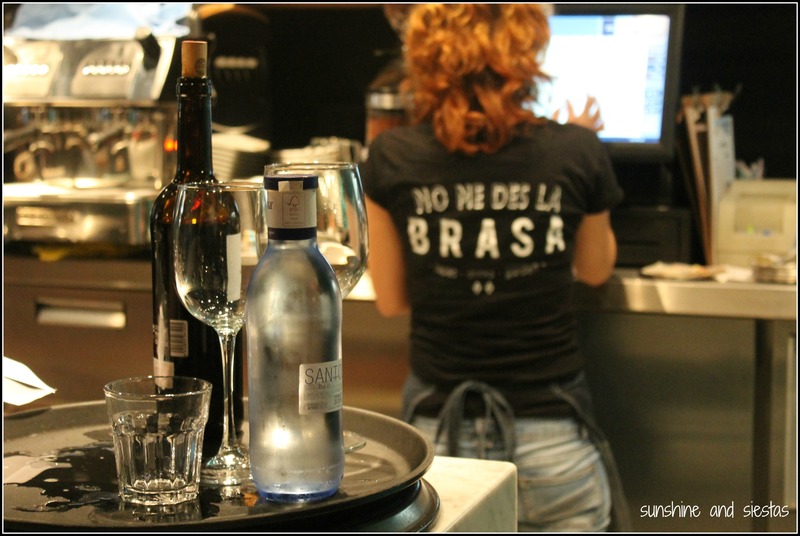 Most tapas bars allow you (or force you if it’s that popular) to eat at the bar itself, giving you the chance to bark your order to the waitstaff without flagging down a frazzled waiter. Bonus points for the bar if they tally your tab in chalk right next to your plates. The bars clustered around the city center should be your focus if you’re visiting Seville – check out the bull meat entrées served in El Arenal, choose international dishes and Spanish favorites around El Centro, and opt for al fresco dining in La Alameda. Be aware that many bars will not have English translations, and if they do, they’ll often leave you just as confused (seriously, I once saw ratatouille listed as ‘tomatoes attacked by angry vegetables’). Start by ordering a few plates – you can always get more if you’re still hungry. 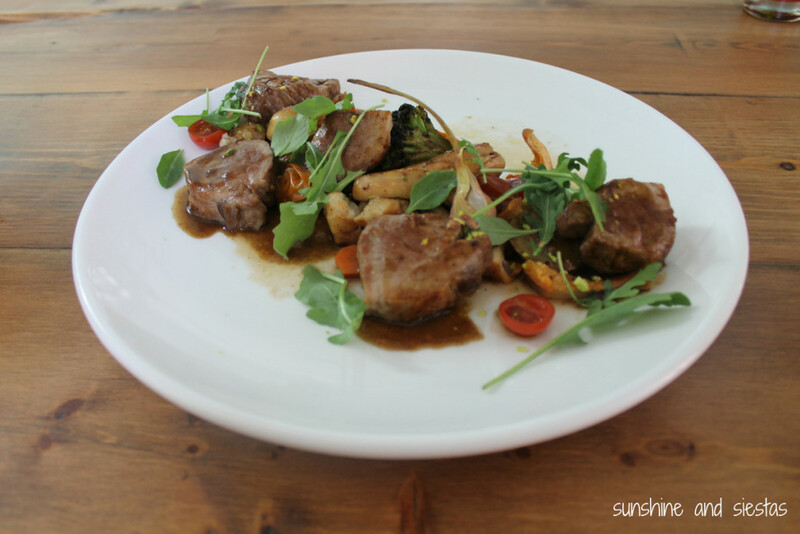 If you’re overwhelmed, leave it to the experts at Devour Seville. This four-hour tour will have you sampling eight dishes, which is enough to feel satisfied without being stuffed. The guides are knowledgable and personable. 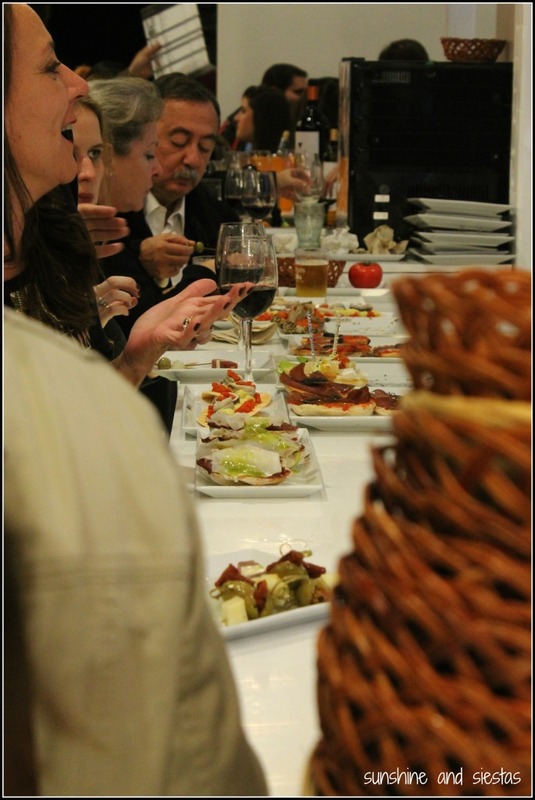 Prices start at 65€ for their Tastes, Tapas & Traditions tour. Devour Seville allowed me to tag along on their inaugural tour, though all opinions are my own. 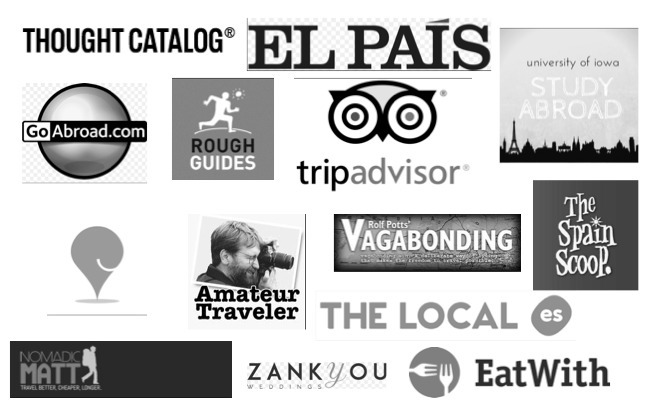 I’m a big fan of their mission – to use local vendors and provide customers with a taste of Spain – and their excellently assembled tours! 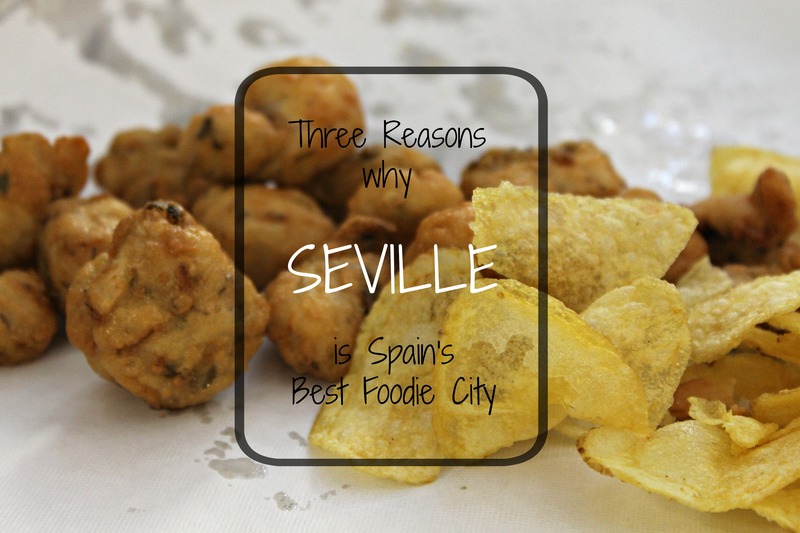 Have you ever eaten in Seville? 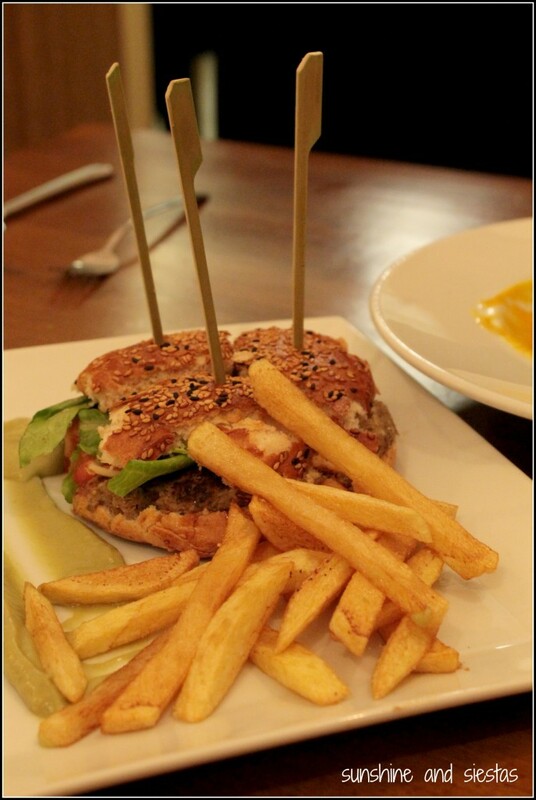 What are your favorite places to chow down? 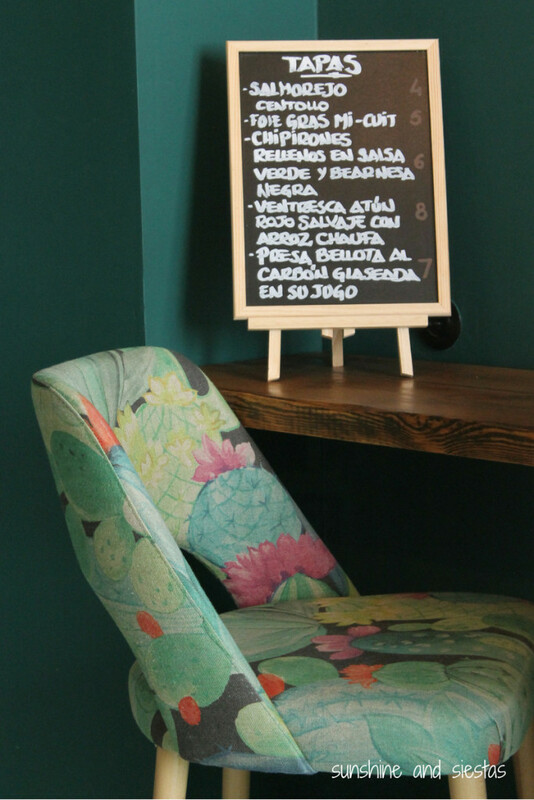 I’ve got loads about food in Seville, from Tapa Thursdays, which highlight foods and restaurants, to recommendations on where to eat in town. My instagram is also full of food and beer photos with fancy filters – follow me! My email notification pinged a few seconds after I’d hit the little paper arrow with a food suggestion for a friend. Crestfallen to be missing out once again on the nearly year-old ecological restaurant buried in Soho Bendita, I decided to save sampling Fargo (C/ Perez Galdos, 20 in the Alfalfa) for another night. That night was the night before Phyllis and I would be meeting for lunch to celebrate a 30th birthday, and where else would a vegetarian choose to go but a slow food, ecologically-centric eatery that’s de moda? I parked my bike and met Mickey in front of a building painted the color of a spring sky in Seville. 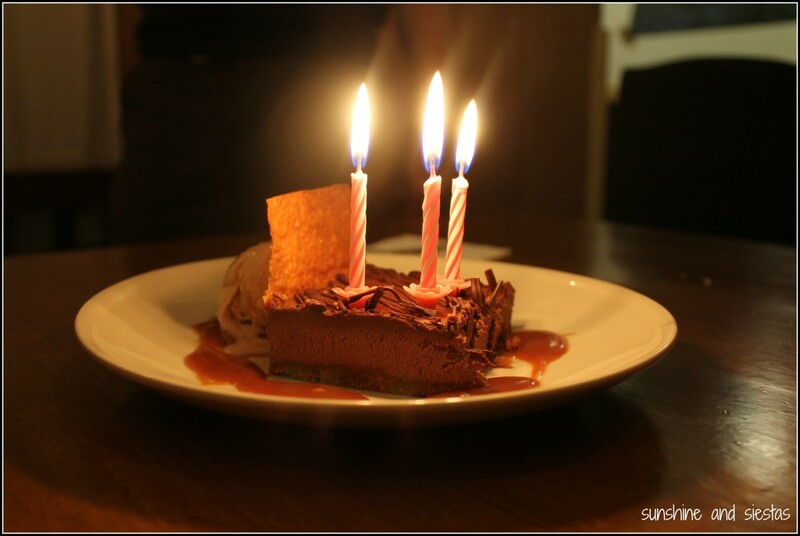 Living in the neighborhood, co-owner Yann greeted her immediately and offered up suggestions for a birthday treat. What struck me about the space is that it was stark but felt cozy, from the small bar near the entrance to the corridor-like dining room. Yann was part of the concept at ConTenedor, a slow food kitchen around the Feria neighborhood, and was looking to branch out into something that valued ecological products. 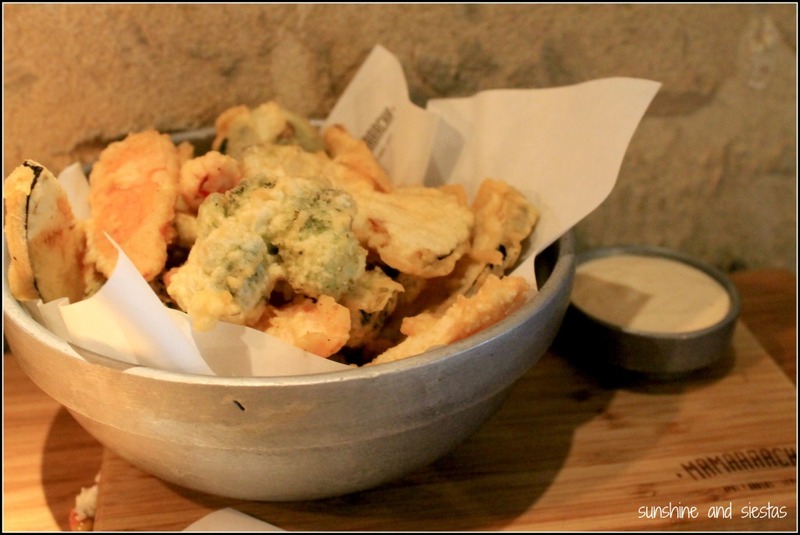 Meats, veggie and fish dishes graced the slate chalkboard menu. After an aperitif and thirty minutes of catching up, Yann came to take our order. Because the space has a decidedly eco feel, the menu changes almost daily, according to what’s at the market. 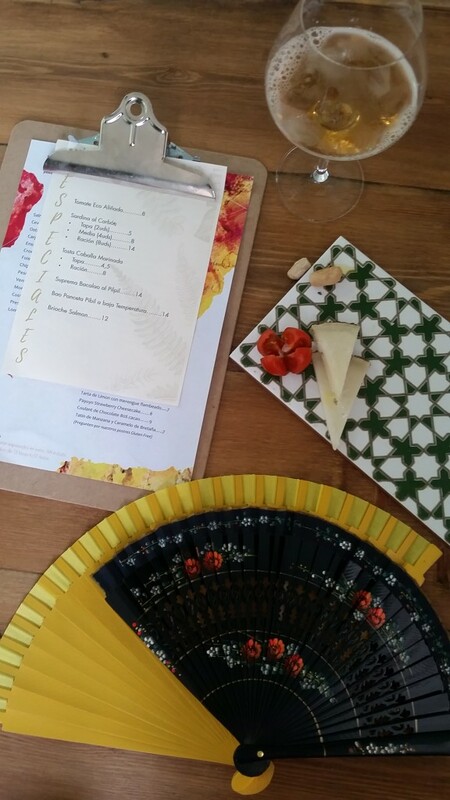 We settled on a plate of pumpkin and raisin croquetas to share and a dish for each of us – I’d been sick during the week and stuck to a taboulé with mint, granada seeds and pineapple. Mickey chose a chickory soup and Kelly went for the veggie burger, plus water and freshly squeezed juices. 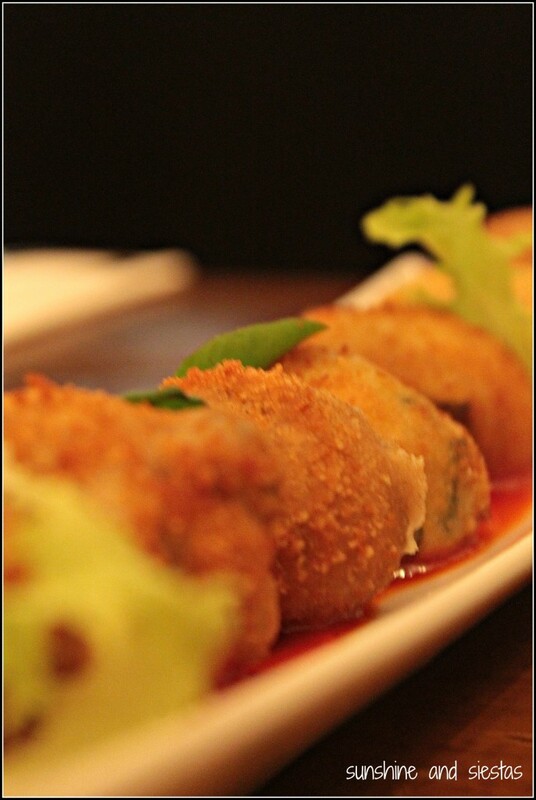 The croquetas were definitely the star of the night – creamy and full of flavor, and the veggie burger was filling. My upset tummy left feeling like it was satisfied and that I’d chosen foods that wouldn’t bother me. 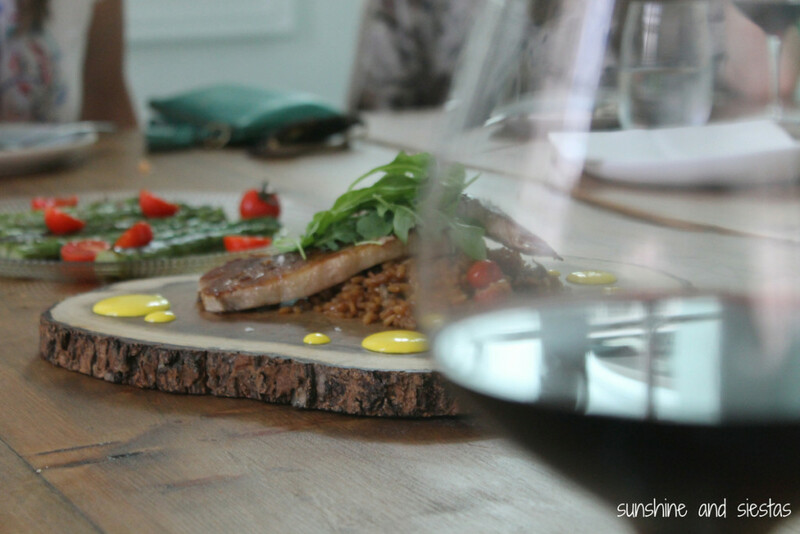 The service was spot-on between Yann’s friendliness (and dance as he brought out the food) and the presentation of the dishes – appetizing without being pretentious. 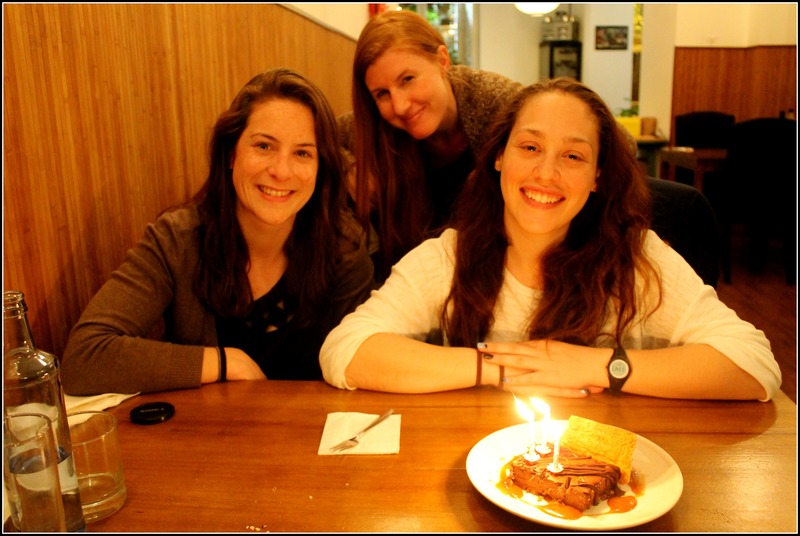 When it came time to order dessert, the birthday girl was set on two – you only have a birthday once a year, anyway. We chose two, but I beelined to the bathroom for the second time in two minutes to tell Yann we were ready for the dense chocolate mousse we’d ordered before. As the night stretched longer, our voice grew louder, despite the lack of alcohol. 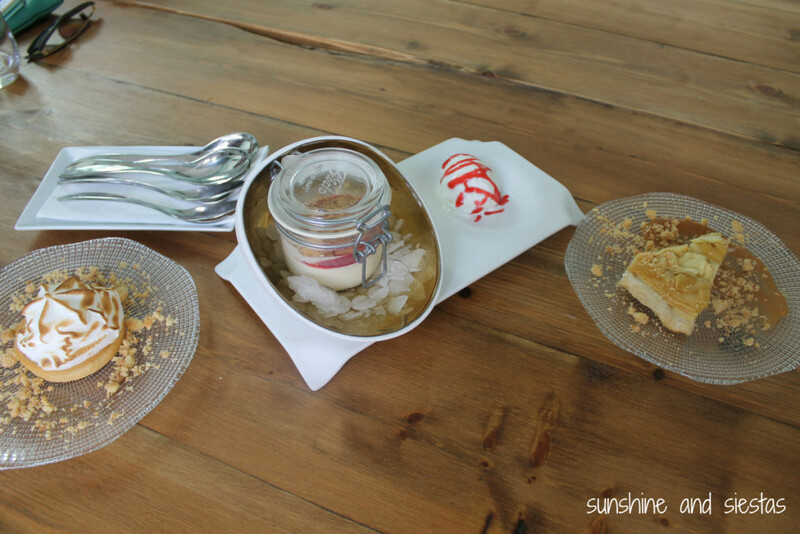 We are rarely able to find time to spend together, so we lingered at the table over tea and the last few bites of dessert. 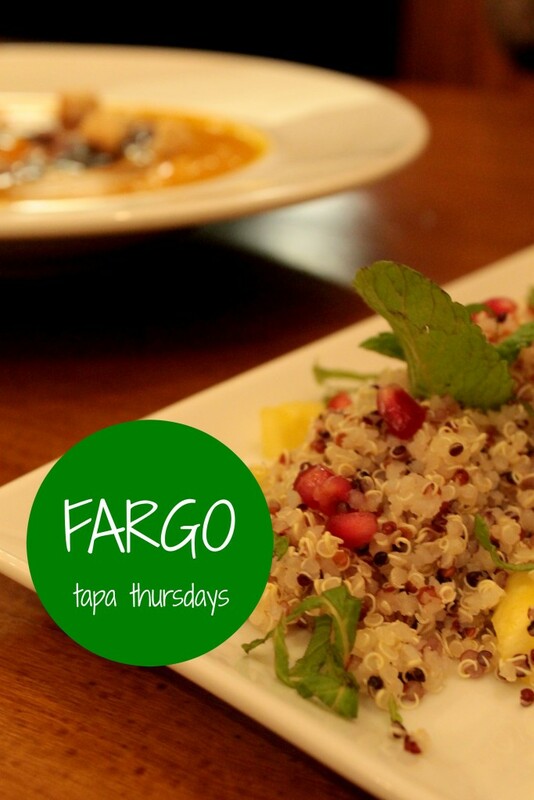 If you go: Fargo is located at the heart of the Alfalfa neighborhood and set between boutiques in the trendy Soho Bendita area. 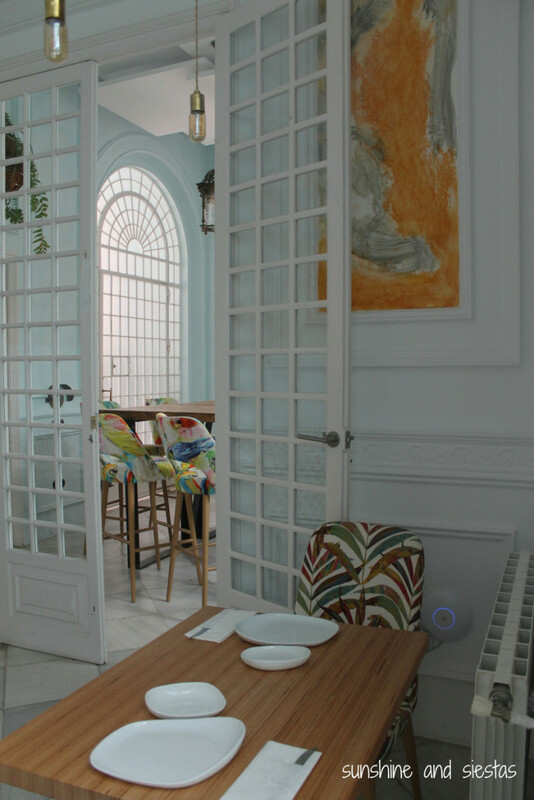 The address is Calle Pérez Galdos, 20. Open Monday – Thursday from 8pm until midnight and weekends for lunch and dinner – they’re also rumored to have a staggering wine list, though we didn’t imbibe. Reservations accepted: 955 27 65 52. We paid about 20€ a head. 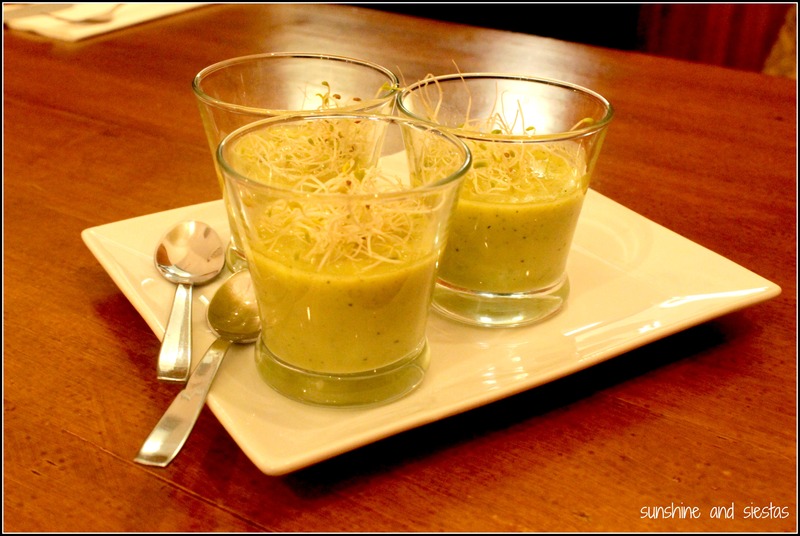 Have you ever eaten at a bio restaurant? To say that Barcelona (as a city) underwhelms me is an understatement. And its food? Ugh, I don’t even want to go there. In my half a dozen previous trips to Catalonia, a place renowned for being avant garde – in food and otherwise – I’d never really had a decent food experience. From the overpriced paella on Las Ramblas to reheated pintxos in El Born, I was decebut. That’s where Eat Guides came in. Written by Regina Winkle-Bryan, an transplant from foodie haven Portland to the Ciudad Condal, and Adrián Benítez Martos, a born and bred barcelonés, did my homework for me. I was thrilled to have Reg send me a copy of the ebook she and Adri had penned to help tourists like me understand catalan cuisine and where to find it. Using my hotel near La Rambla and the Boquería as a starting point, I had a few hours to kill before meeting a friend and wanted to dive headfirst into real catalan cuisine. The 123-paged book lists food joints by both neighborhood and proximity to big sites, but I was interested in seeing if there was real food amidst the tourist traps in the old city. My rules – I had to be able to reach it on foot, wouldn’t order from a menu translated into English and would try four places over the course of the day. I had already zeroed in on my first stop of the day before touching down in Barcelona. After taking the first flight out in the morning, I was starving by the time I checked into the hotel, so I quickly dropped my bags and walked into the Barri Gòtic. 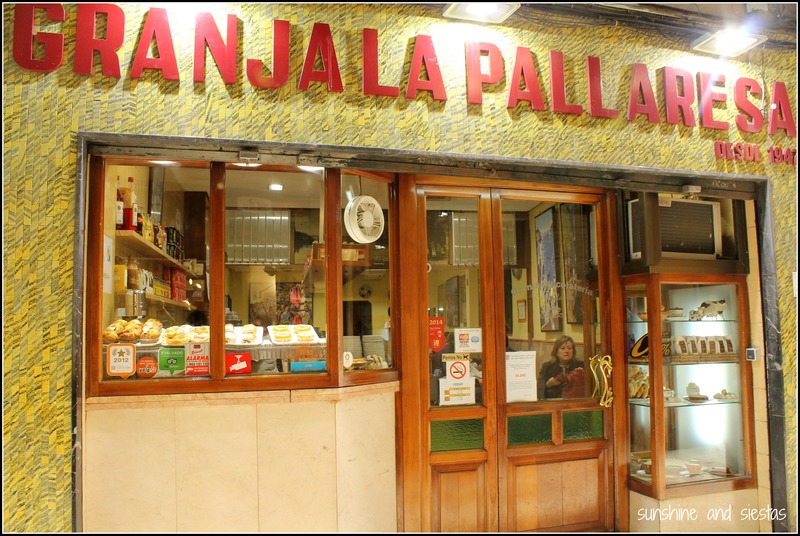 Granja La Pallaresa as literally 30 meters off Las Ramblas, but you would have never known. This is lo mío: Castillian and catalan blended into one incomprehensible buzz in the wood-paneled bar manned by a portly woman and her husband, who sported a black satin bow tie. 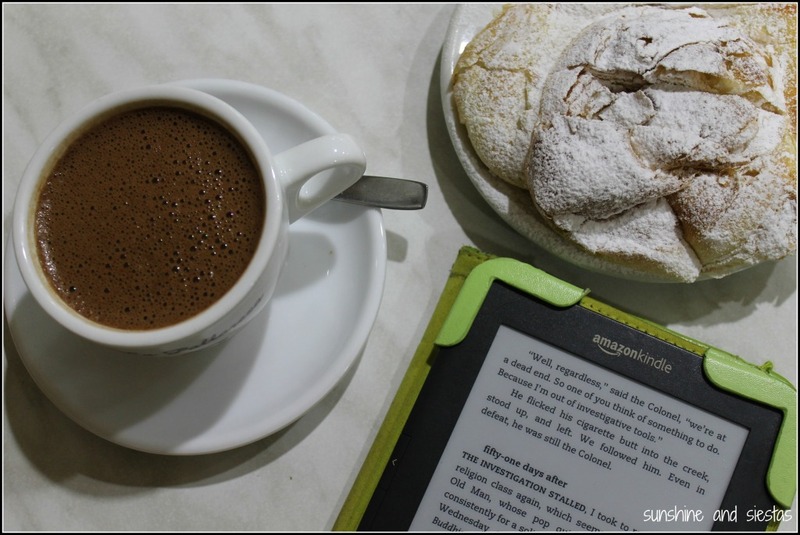 I didn’t ask to see a menu, but ordered what Regina suggested: an ensaimada pastry and a cup of French chocolate. I watched as the other patrons read newspapers in catalan and picked at their churros. My flaky ensaimada arrived with so much powdeed sugar that it left a ring on the table as I paid my 4,15€ and drank down the chocolate. Carrer Petrixol, 11. Open Monday to Saturday from 9am to 1pm and 4pm to 9pm, and Sundays from 9am to 1pm and 5pm to 9pm. When Catherine and I went to Barcelona a decade ago, we stayed in El Raval. It’s gritty, it’s long been considered seedy and unsafe, and it’s full of old man bars. I wanted to take the long way to my next stop, but the long way meant passing a whole slew of old man bars, and I always get sucked into them. Just two blocks down, I found that these so-called ‘bodegas’ are staples in working neighborhoods. 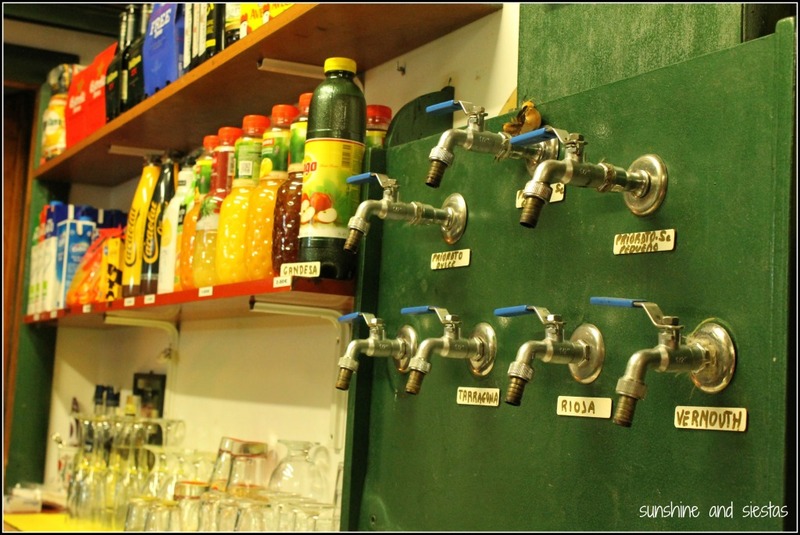 Much more than just a bar, the bodegas also sell drinks and snacks, as well as canned goods, and locals have their preferred place. I ordered a vemouth at 1,85€, which came with four mussels. I took Catherine back the next day. Carrer del Pintor Fortuny, 26. Open daily, though I could never tell you when. 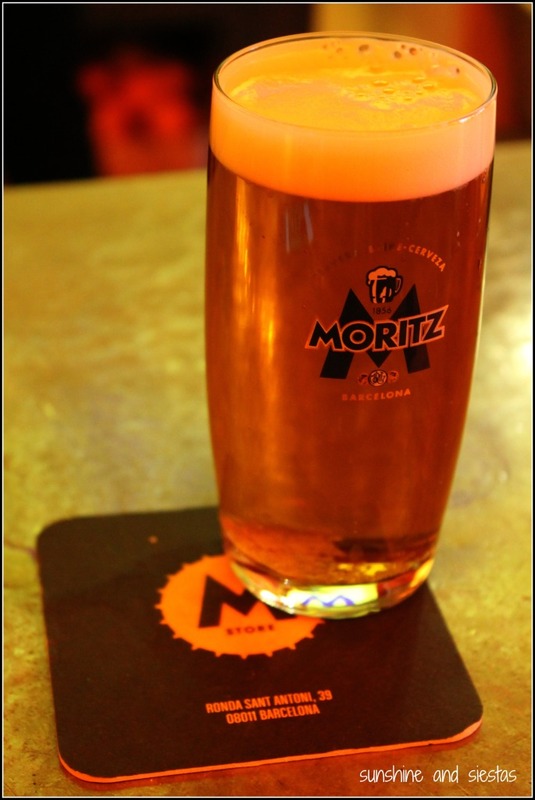 I knew Barcelona produced Estrella Damm beer, but Moritz is served on tap at many bars in the region. Its namesake was the brewery’s founder, Louis Moritz. 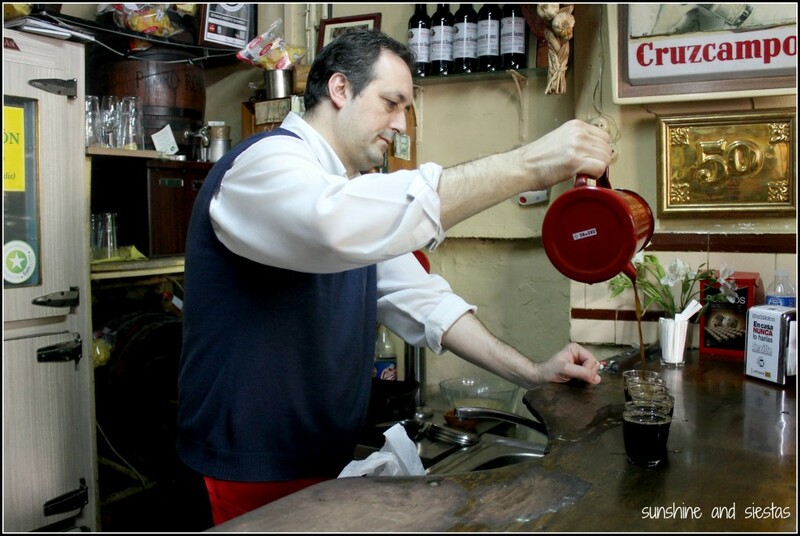 Barcelona has long been a haven for foreigners, and Moritz left his native France for the ciudad condal in the 1850s, setting up a small brewery in El Raval. 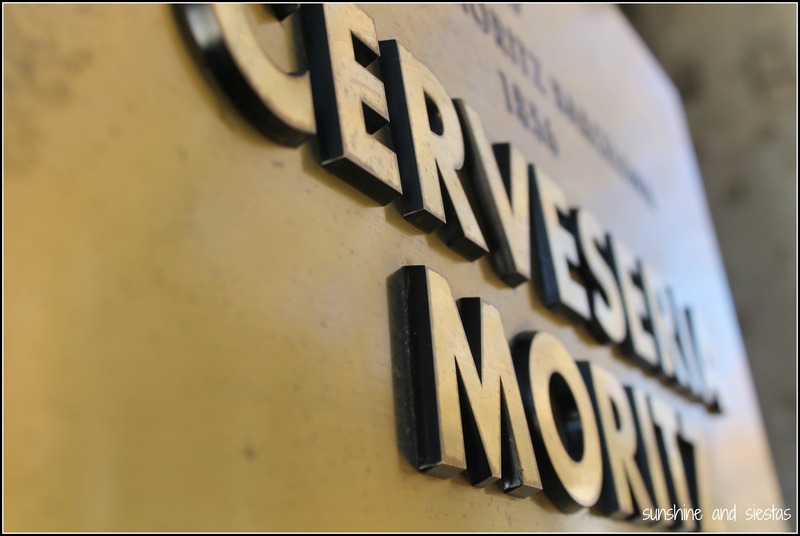 More than 160 years later, Moritz is the only beer in the world whose marketing is done entirely in Catalan, and their swanky headquarters is part museum, part brewery and part gastrobar. Though beer is no longer mass-produced on Ronda Sant Antoni, they do serve two types of unpasteurized beer that’s been made in-house. I had two – one of each flavor – for 3,80€. Ronda de Sant Antoni, 41 (Universitat or Sant Antoni). Open daily from noon to 2am. Accepts credit cards. My hunger had somewhat dissipated by the time I got to Onofre, a tapas bar located just inside the Barri Gótic’s old city walls. Part restaurant, part wine shop, I was actually asked to get up from my seat when a patron wanted to snag a bottle of wine from right behind me. The place felt intimate – there was another lone diner and a group of business people chatting quietly at a table in the corner. 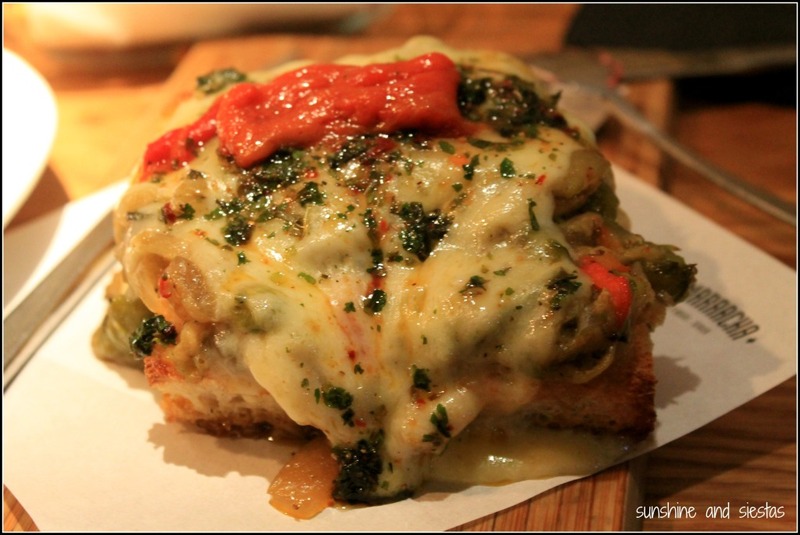 Without thinking much, I blindly ordered the menú del día without even checking out the tapas menu. As Adri points out in Eat Guides, quality tapas bars in the center of town are hard to come by, but Onofre does regional tapas and does them well. The menu featured three dishes: a creamy lentil purée, over-roasted provolone with red berries and a spicy carnitas burrito, followed up with a slice of cake. 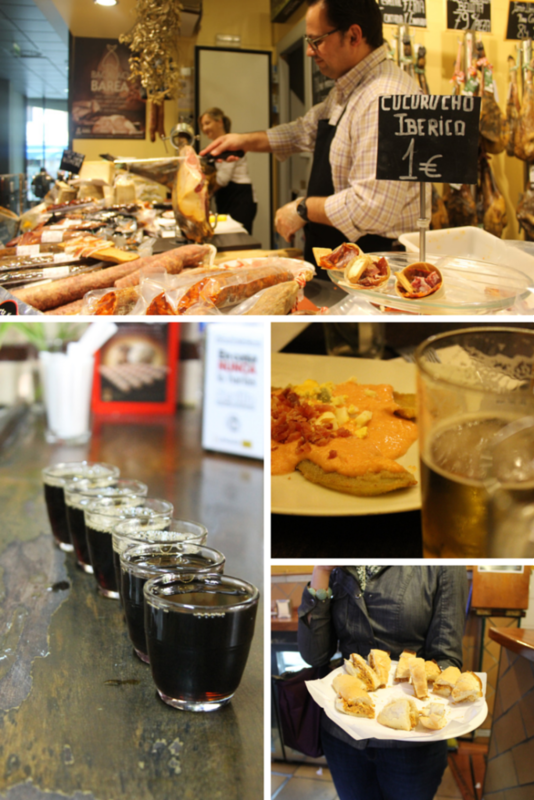 Overall, they were probably the best tapas I’ve had in Barcelona, but nothing terribly special. The four dishes and a beer cost 10,75€. Carrer de Magdalen, 19 (Jaume I). Open Monday to Saturday from 10am – 5pm and 7:30pm – midnight. Good food isn’t completely absent of the Barcelona cuisine scene, though you have to know where to look. 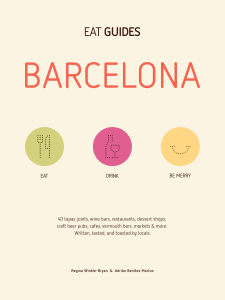 Any place on the Ramblas and Barri Gòtic (as well as near a touristic monument) is more or less off-limits, though Gràcia, Poblesec and Poblenou are said to be up-and-coming gastronomic hot spots. Using what I’d read in Eat Guides, Saturday night would be a time to venture out on our own and see if we could find something good. We headed to Sant Antoni on foot to see the neighborhood’s Correfoc, a rain of sparks and firecrackers in the street. Even after a food tour in the morning, we were stuffed. Casa Lucio spilled light onto the dark street. 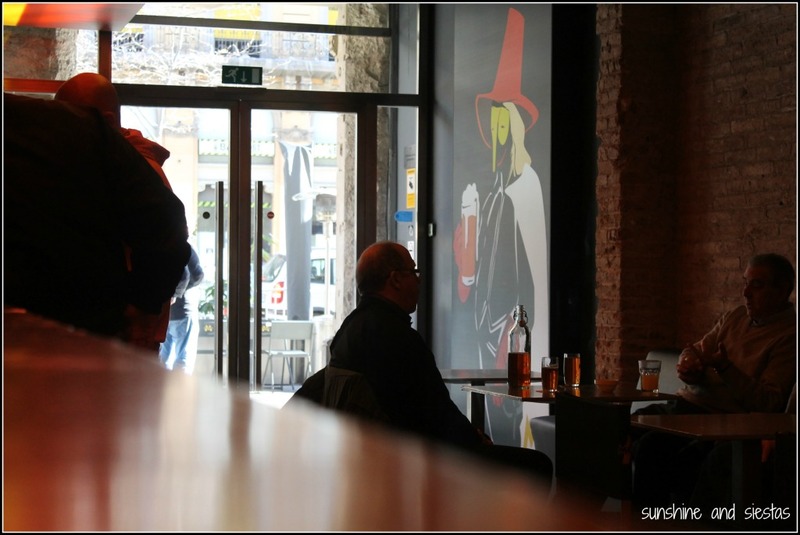 The place felt like a cave, with a small bar, seating downstairs and racks of wine on the wall. We ordered a few glasses of Habla del Silencio and asked to see a menu. But there was none, so Lucio, a moody old dog with glasses and a thick white beard, listed what they had orally. The only other person who spoke English in the whole place was the waiter, Patrick.We ordered more than our fill, mainly pintxos of meats and cheeses, as well as a bottle of wine to take with us, for around 60€. Carrer de Vildomat, 59. Open for lunch and dinner. 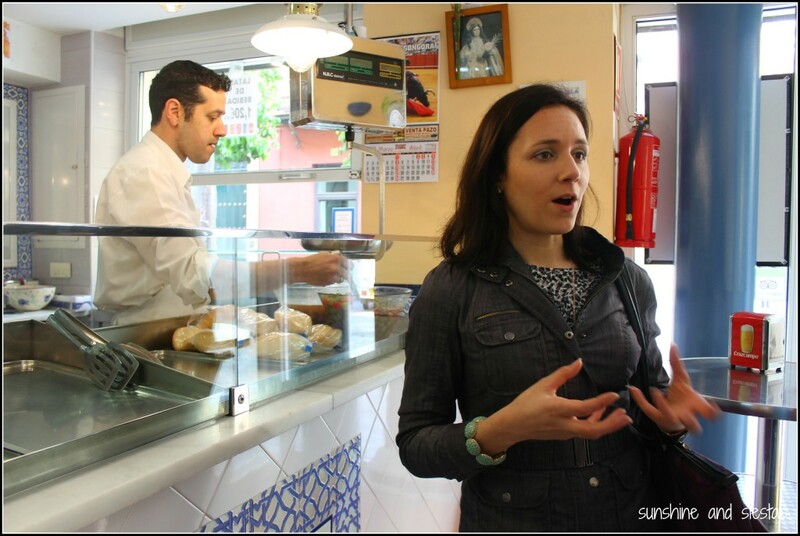 Having shared a meal with Regina as part of the Spain Scoop team, I knew that eats are important to her. It’s no surprise, then, that the Eat Guides ebook is a fun read and more than just a guide on where to eat – each listing has anecdotes, recommendations on what to order and drink from both vegetarian Regina and her carnivore co-author, plus a rough estimate on price for a meal for two. 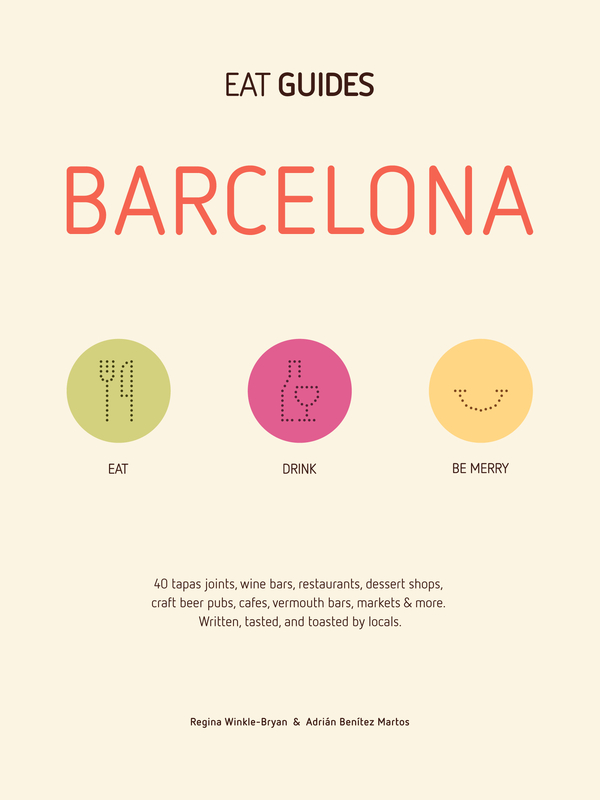 The guide is also easy to use – there are numbered maps, guides by type of food and neighborhood, as well as a handy translation guide to catalan words that a Castillian speaker likely doesn’t know. And then, of course, there are plenty of listings for watering holes, along with tips for markets and gastro-themed side trips. If you like to eat, this book is a multi-course meal, served simply but that will leave you stuffed. The guide is $4.99 on Amazon, iBooks and Google Play – a small price to pay for a big guide! You can also take my article on your phone – offline! – by downloading GPSMyCity and purchasing this guide with built-in GPS. Your purchase helps run this site! 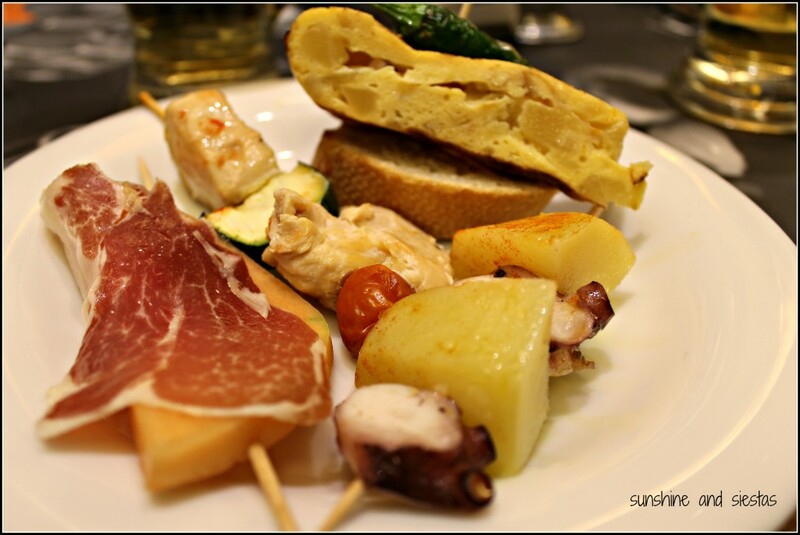 One thing you absolutely must do: tell me your favorite Spanish dish – catalan or otherwise! 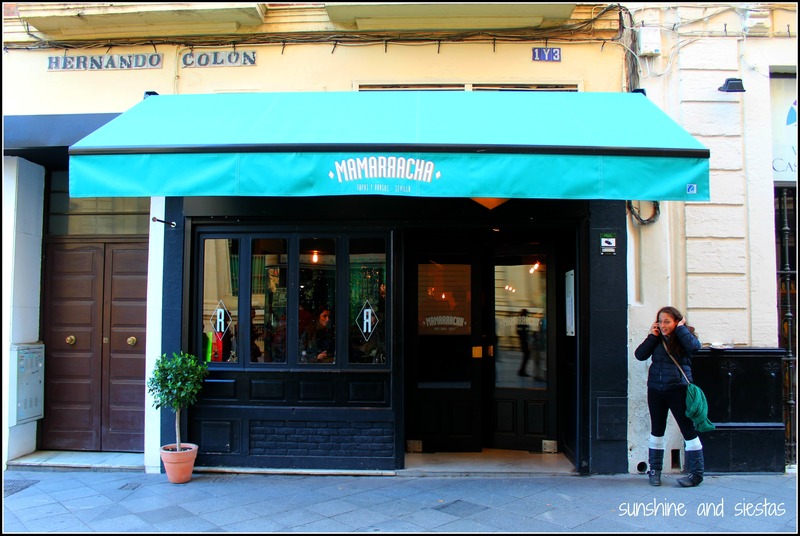 If a mamarracho is a person who deserves no respect, relatively new tapas bars Mamarracha, on Hernando Colón, is not aptly named. I’d heard rumors of a new bar from the Ovejas Negras group, and despite the packed bar on a Saturday afternoon, I’d been assured that the wait was worth it. What struck me immediately about the bar were two things: how calm the wait staff was with patrons practically hanging off the bar, and how sleek the interior looked. Like Ovejas Negras, the narrow space echoes an old ultramarinos, with slate black mixed with natural wood and a creamy turquoise tile accent. The space was choked, but the inviting back dining room features a garden wall and several tables. Lesson leaned (again) – don’t arrive at 3:30 p.m. I grabbed a glass of wine and Kelly a tinto, and we went outside to escape the crowds, leaving our names with a hostess who had her hands full, yet chirped out off-menu specials seemingly every two minutes. 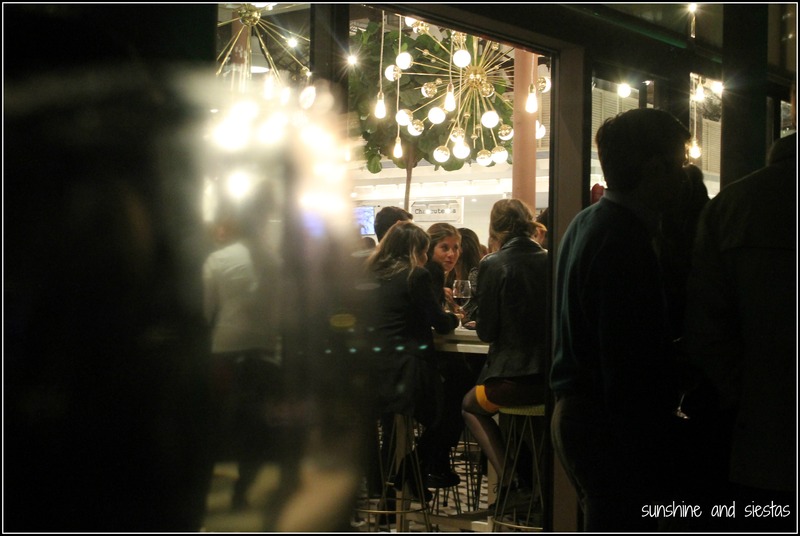 We were able to snag the corner of a bar area and tucked into a menu featuring smoked meats, several options for vegetarians like K and an extensive wine list. 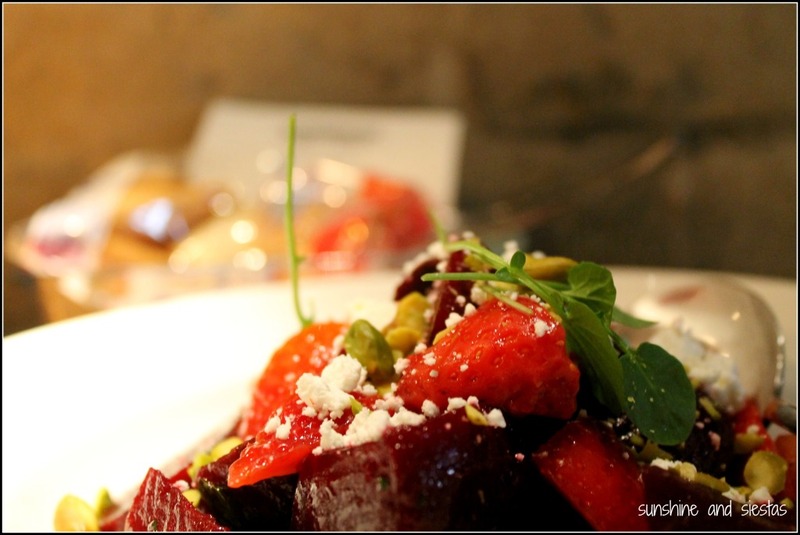 We started with a strawberry and beet salad with feta, along with a foccacia topped with cheese and veggies that we’d seen march by. I wasn’t a fan of the acidic Ribera wine I’d sampled and switched to beer. What differentiates Mamarracha from ON down the street is that they have word-burning stoves and indoors grills, so I wanted to try some meat. Kelly ordered veggies in tempura, and I asked the waitress for a recommendation. She offered up the corral chicken, which came with a chimichurri sauce, and a baked sweet potato, plus a tapa of morcilla. All of the food was tasty and fresh, though I had to send the chicken back for being undercooked. 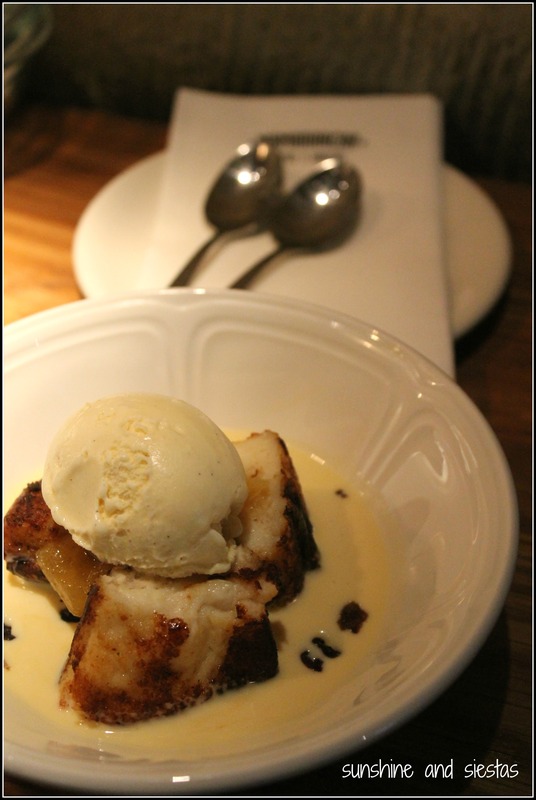 By the time it came back, I was nearly stuffed but couldn’t pass up a dessert. We chose a sevillano favorite – homemade torrijas with vanilla bean ice cream. 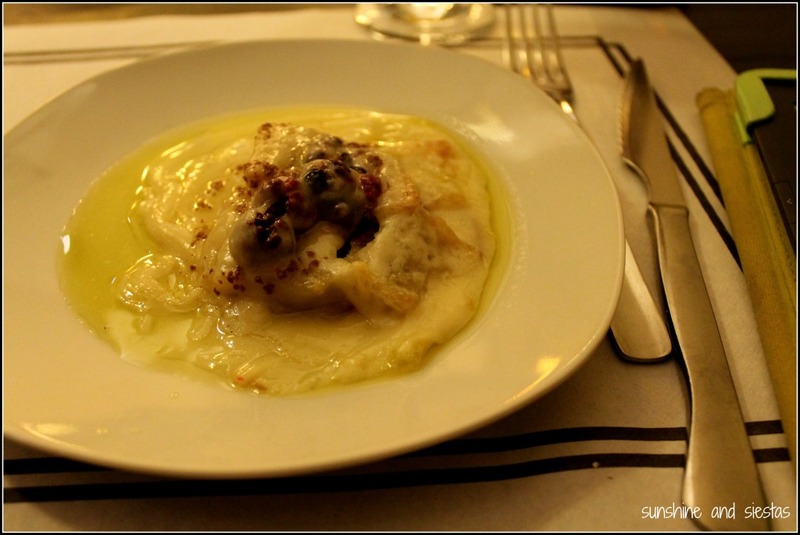 The bill was adequate for all we’d consumed – five plates, a dessert, a glass of wine, two beers and three tintos – 54€. We left satisfied and practically rolled over to Ines Rosales next door, where we bought Christmas goodies for our families. If you go: Mamarracha is located right down the street from the Ayuntamiento and the main exit of the Cathedral, on Hernando Colón 1 y 3. Opening hours are daily 1:30pm to 4pm and 8:30pm to 11:30pm. Arrive early if you’d like to sit or eat promptly! 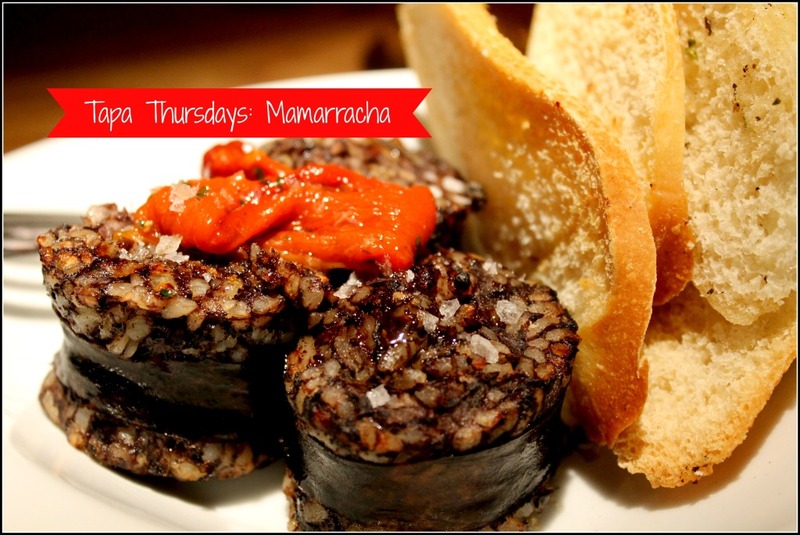 I ate at Mamarracha as part of the Typical NonSpanish Project with Caser Expat. But don’t worry – all opinions and calories are my own! 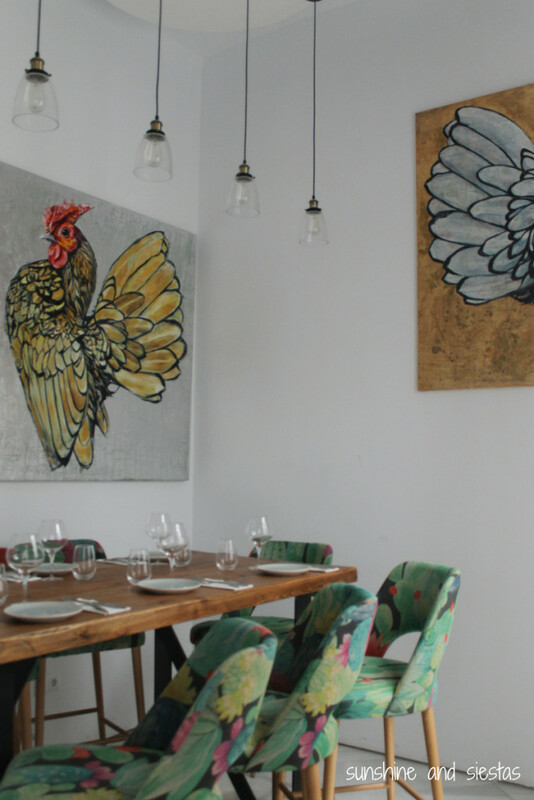 In a city renowned for tapas culture, more and more foodie-friendly offerings are popping up. From wine tasting packages and jamón cutting courses to ethnic bars and even a midday flamenco show, I’d thought I’d seen it all in Seville when it came to merging food and culture (hello, my favorite parts of blogging). Then ex-bullfighter Fran Rivera (also the ex-son-in-law of the Patrona of Seville, Cayetana de Alba) pumped money into a gourmet food market in a century-old building. While mercados and plazas de abastos are nothing new to la vida cotidiana in Spain, places like La Boquería and Mercado San Miguel are becoming tourist destinations in other cities, and Rivera and business partner Carlos Herrera are jumping on Spain being a foodie haven (and anyway, people have to eat). Mercado Lonja del Barranco opened in late November to crowds, to rain, to runaway success. 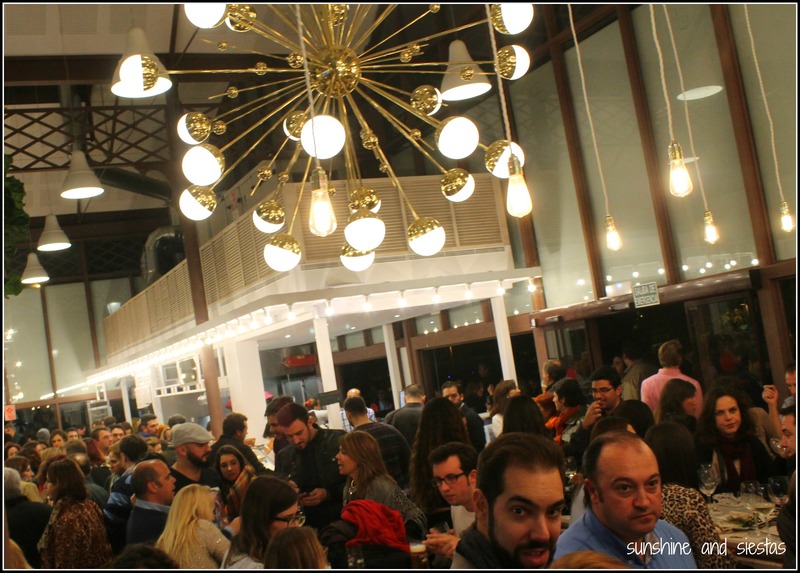 Housed in a glass and wrought iron building that served as a fish market until 40 years ago, the space has 20 different puestos featuring regional goodies, as well as half a dozen free-standing food carts and a Cruzcampo beer station that allows you to sample recently-brewed beer. Each puesto has a specialty item, like acorn-fed ham, salmorejo or the mythical Spanish omelette, and there are a few cocktail or wine bars. 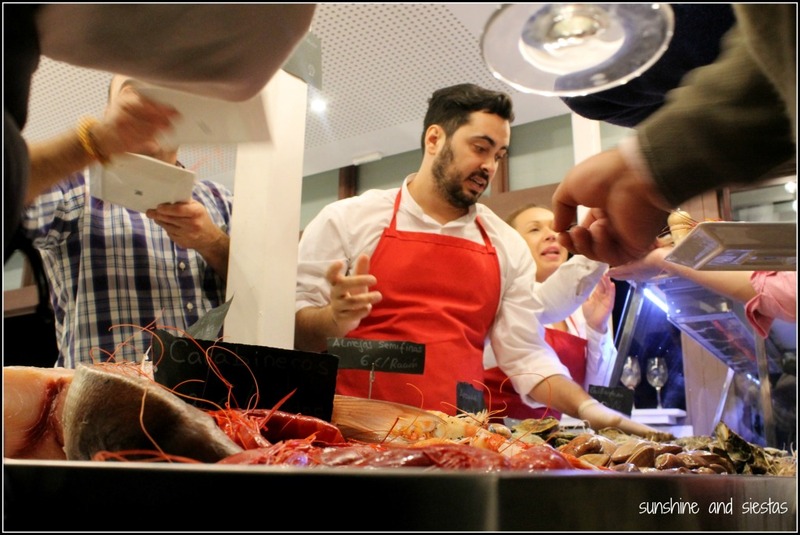 And much like the Corte Inglés Gourmet Experience, several local restaurants have set up shop. The result is a chaotic but bright and lofty space with impeccable decoration, though seating is limited indoors and there is not rhyme or reason to the set up – it feels like a maze, even when empty. It’s less market and more fancy schmancy food hall, but the Mercado de Triana is right across the Puente Isabel II should you need fresh vegetables or a craft beer. The Novio and I met some friends on a Friday night shortly after the market opened. Even with rain clouds threatening, the place was packed to the (iron) gills. We found a table outside and just ordered a few beers, unwilling to sidle up to anywhere but a beer tap. While the food offerings looked incredible, there were far too many people to really enjoy the experience. As I’ve passed by in subsequent days, the market remains busy but the novelty has worn off a bit – perfect for sampling tapas or ordering sushi to go. 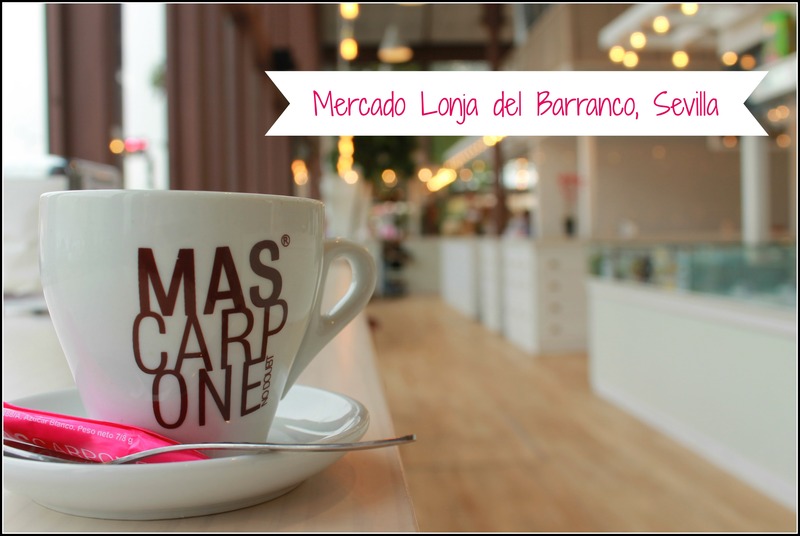 If you go: Mercado Lonja del Barranco is open daily from 10am until midnight; open until 2am on Friday and Saturday. Prices are variable, but expect a minimum of 10€ a head. The market plans to open cultural offerings, such as workshops and theatre, in the future. Check their webpage for more. 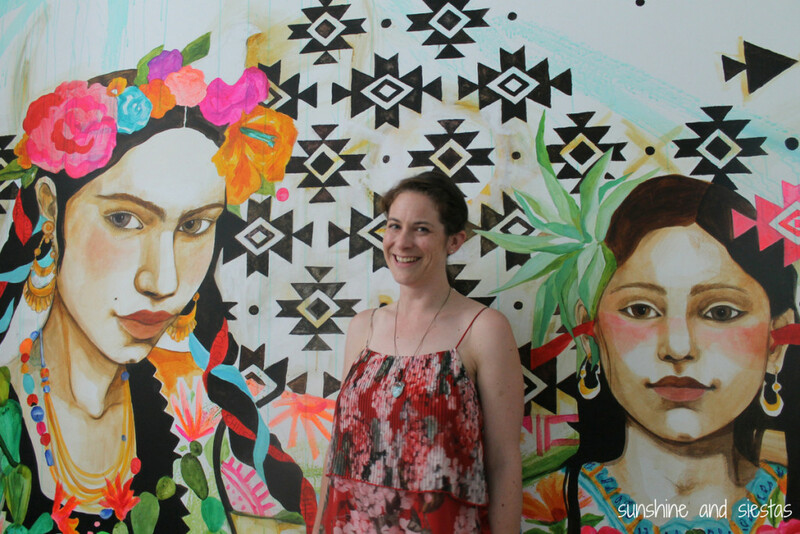 I visited the Mercado Lonja del Barranco as part of the Typical Non Spanish project with Caser Expat. The power the experience, I enjoy and write about it in my own words. All opinions are my own. 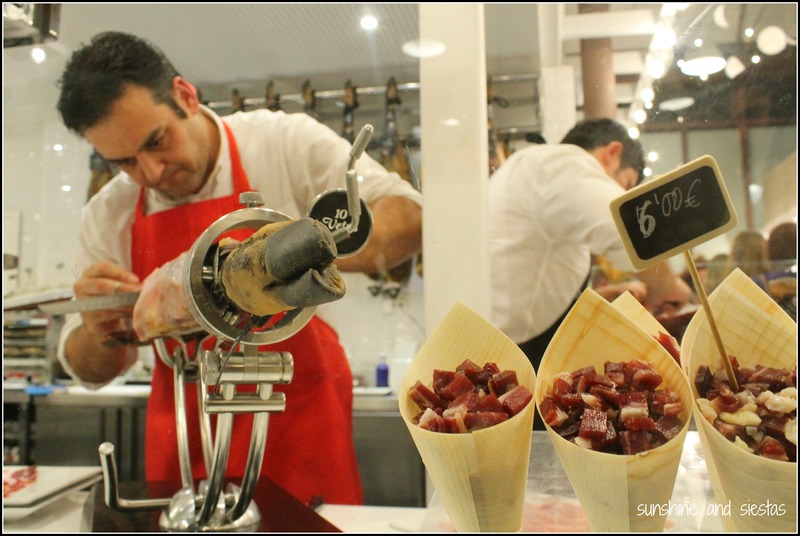 What’s your favorite gourmet market in Spain?